Mt. 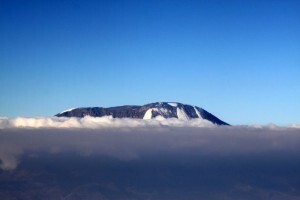 Kilimanjaro (19,341′), Tanzania, is the highest mountain in Africa and the largest free-standing mountain in the world. 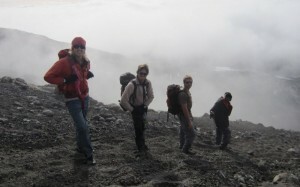 While not technical nor requiring glacier/snow travel, the higher altitude becomes the main obstacle for hikers. 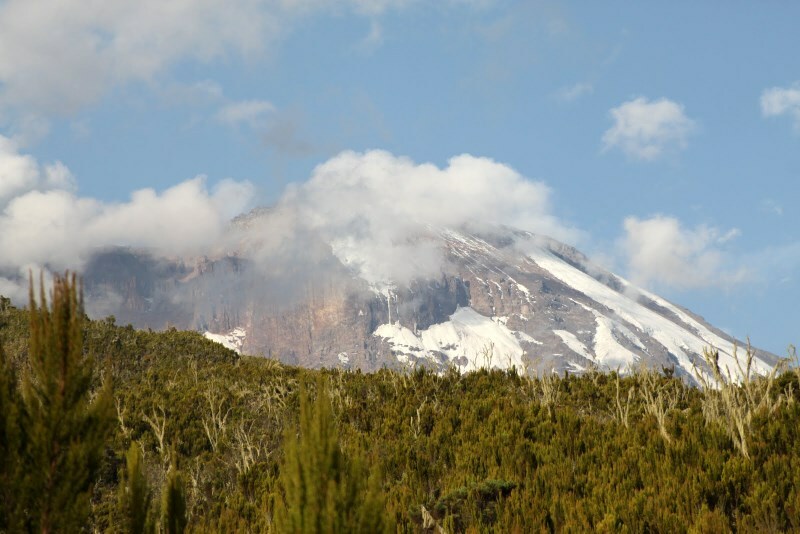 However, with a good trail through varying alpine zones leads and beautiful scenery to the summit, a good pair of sturdy legs, and strong lungs and mind will usually grant one success on Kilimanjaro barring any altitude issues. Our climb of Kilimanjaro was a very special highlight for Kristine & myself in that we got to share the experience with so many of our good friends for whom climbing big mountains is not a regular occurence. For everyone else on our team, Kilimanjaro’s summit would be by far the highest elevation to which they have ever been. And, in the end, everyone’s training and perseverance paid off as we had 100% summit success for our 9 person team. Kristine had flown to Tanzania on July 31-August 1 to visit her sister Carrie’s school called Jifunze in the small town of Kibaya. 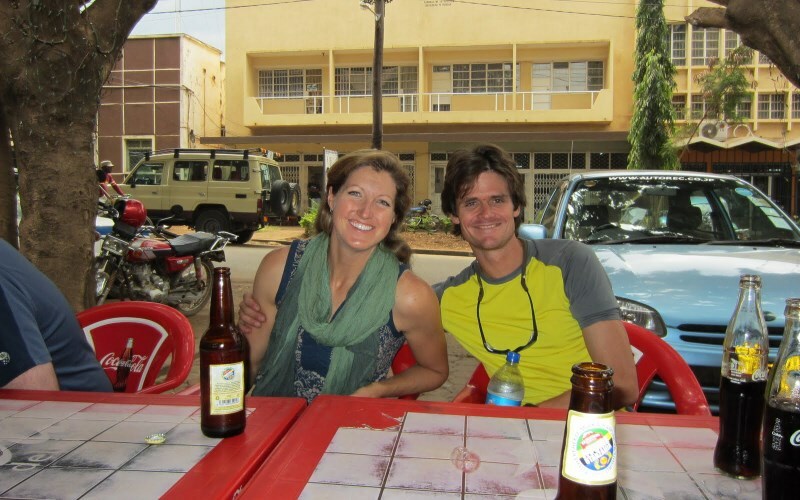 Carrie originally founded the school in 1999 and had organized several friends of hers in Tanzania to help Kristine feel welcome and comfortable upon her arrival. Kristine was picked up at the Kili Airport, stayed in some friends’ home in Arusha, and then taken to the bus station for transit to Kibaya. I think the 7 hour bus ride was interesting to say the least, but Kristine made it to Kibaya and stayed with local Christina Gabriel and her family during her 4 day visit to Kibaya and Jifunze. Christina helped found Jifunze with Carrie and remains close friends with Carrie. 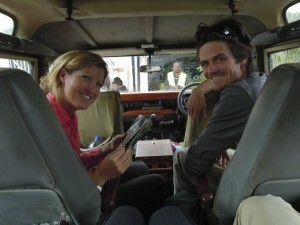 For more information on Jifunze and Carrie’s involvement with the school, please check out Jifunze on the web. 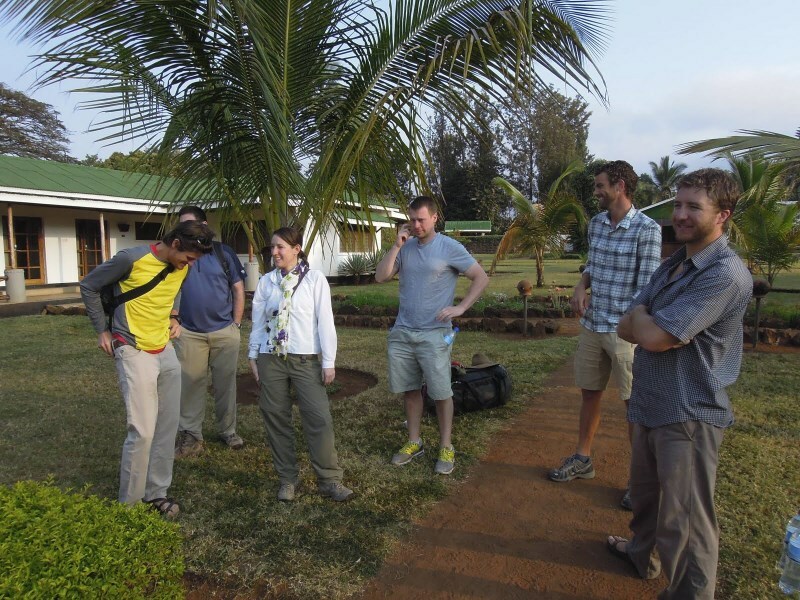 Kristine had a great time visiting Jifunze and interacting with the locals in the small Tanzanian town of Kibaya, but was definitely excited to meet up the rest of the Kilimanjaro team back in Moshi on August 8. Moshi is a small town at the base of Kilimanjaro. Alex and I flew from Denver to Washington, DC, on August 6 for a nice little 12 hour layover in Dulles airport. Despite how chilly it was during the night hours in Dulles, I was able to get some decent sleep and woke up at 5am to the smell of some Columbian dark roast brewing at the Starbucks Kiosk a couple seats behind my head. Not a bad wake-up call. Dave & Sarah met us at the Ethiopian Air gate and we all then hopped on the long 13 hour Ethiopian Airlines flight direct from Dulles to Addis Ababa, Ethiopia. Ethiopian Air was a nice surprise because honestly we didn’t know what to expect. Its the youngest airline in Africa but has a really good head on its shoulders and has a brand new fleet of Boeing airliners with fantastic inflight service. I think any of us would highly recommend Ethiopian Air. Upon our arrival in the capital of Ethiopia, the four of us boarded our last flight to Kili Airport, an easy 2 hour flight. It was fantastic to actually step foot in Africa, my first time to the continent, but we were all severely jetlagged and looking forward to catching some shuteye in our Moshi hotel, Ameg Lodge. Our Kilimajaro guide, Josephat Meela, and his team picked all of us up at Kili Airport for transportation to Ameg Lodge. It was great to finally meet Josephat after having corresponded over email for 2 years. 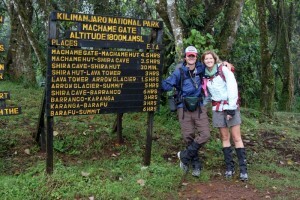 My good buddies, Lee and Betsy Hoffman, had used Josephat’s Kili guide service back in Fall of 2004. 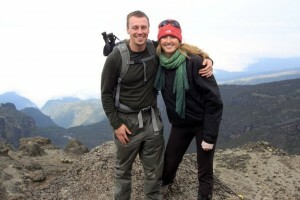 Also, J Weingast and his wife, Megan Gilman, climbed Kili with Josephat in Fall of 2008 on their honeymoon. 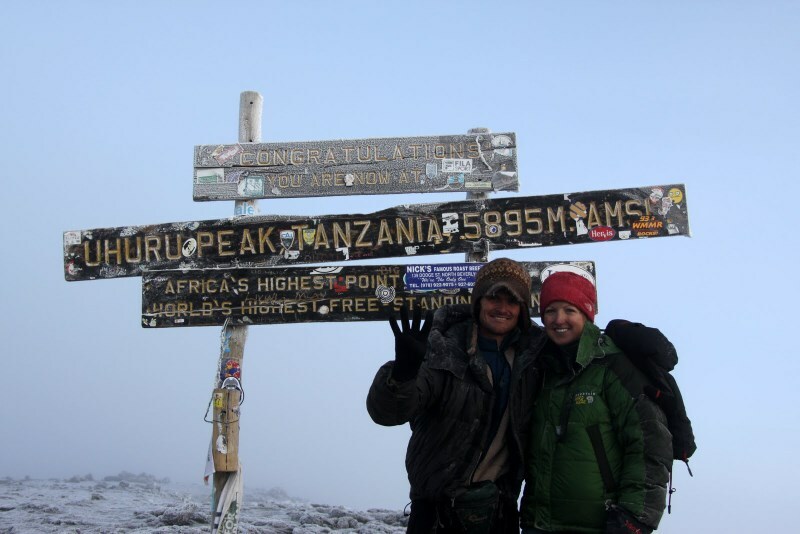 We were originally going to climb Kili with Josephat in Summer of 2009, but we went to France to climb Mont Blanc instead and Everest was in 2010. So, Josephat and I were both very excited at this trip finally coming around for Summer of 2011. Scott and Darci had arrived at the hotel the previous day and greeted us upon our arrival. 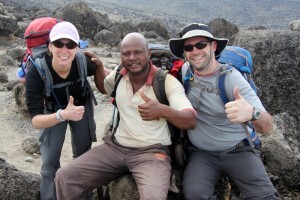 Josephat’s brother, Ernest, another one of our Kili guides, had shown the Hooks around Moshi that morning. I then retired to my room to get some much needed sleep when Chris Carlsen came by to say hello. It was truly great to see Chris again as it had been a few years since he had left Colorado for grad school in California. He had taken a bus down from Nairobi, Kenya, and had just arrived in Moshi. After a few hours of sleep under the mosquito netting hanging down from our bed, Kristine showed up after having taken a bus from Arusha to Moshi that day and a bus from Kibaya to Arusha the day before. Jamie Buckley arrived later that night having come from Chicago via Amsterdam. 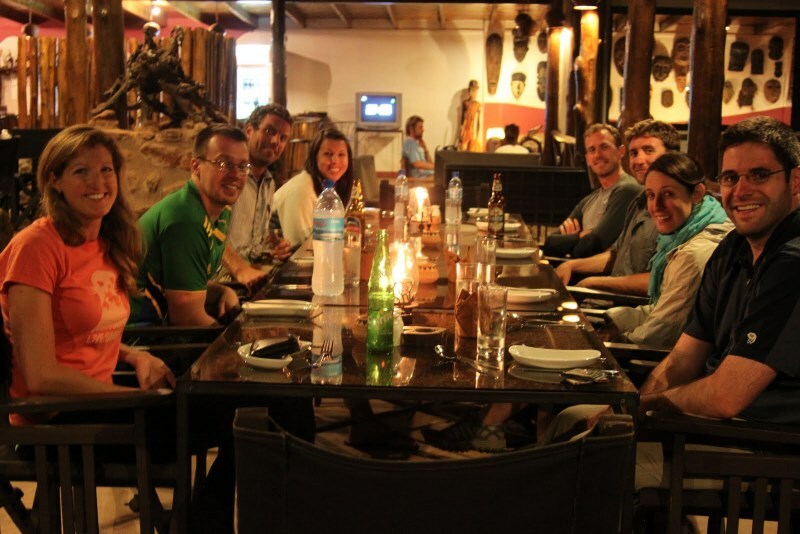 We all sat around an open-air outdoor table in the Ameg Lodge restaurant and had a wonderful dinner and some nice Kili beers. The dinner was great, once we received it, but literally took 2 hours to prepare. We all wondered what went on in the kitchen for 2 hours in preparation of our food. Did they run down to the Moshi market to buy the chicken once we ordered? Who knew. 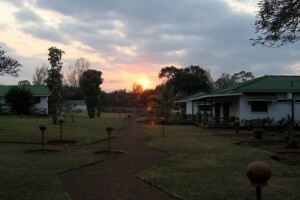 All 9 of us had made it to Moshi safely and we retired to our rooms excited for the hike ahead. The next day we woke up and had a wonderful buffet-style breakfast in the open-air restaurant at Ameg Lodge. The coffee was fantastic as were the eggs and mango I just love drinking coffee for hours on international expeditions on the “non-climbing” days. After settling up with Josephat on money owed for the climb as well as the post-climb safaris for Alex, Dave, and Sarah, Josephat organized some cabs to take all of us into downtown Moshi for the day. If 9 Americans walking around downtown Moshi with a few of Josephat’s team escorting us to round out the posse doesn’t draw attention from all of the local barters, I don’t know what will. We had local Tanzanians trying to sell us anything and everything for hours, and while I understood it was their livlihood and tried to go with the flow, it was in the end pretty annoying. Eventually, we had to be somewhat rude and sternly say “no”. A few of us ended up buying a few items after negotiating a fair price. I bought some pretty cool coasters made of ebony, the hardest wood on earth. The wood is so hard and heavy that it truly seems like concrete. Anyway, we all ended up having lunch at a questionable restaurant on a side street…the chicken we had was even more questionable. We all then got cabs back to Ameg Lodge and did some packing and organizing for our Kili climb, which would begin the next day. Sharing a room adjacent the Levinsons, Kristine and I helped Dave and Sarah organize what they would need and in which bags to pack their gear. Each of us would essentially have a large duffel bag in which our sleeping bag, pad, and other items not needed for the day’s hike would be packed. These duffels would be carried each day by the local porters. All each of us would carry for the day’s hike would be a daypack with water, some snacks, rain jacket, and other personal items. 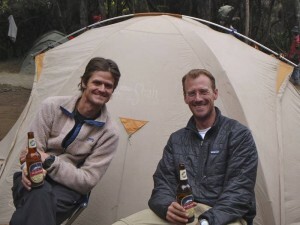 After another great dinner at Ameg Lodge that evening, we were anxiously waiting to hear if my good friend Jason Decker from Denver and his friend Doug Tucci from Maryland, our 10th & 11th team members, would arrive on time that evening at Kili Airport. 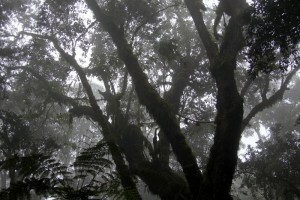 Its always a gamble planning to arrive the night before a climb when traveling halfway around the world. Josephat was at Kili Airrport awaiting their arrival and called me at Ameg Lodge after their plane had landed and told me there was no Jason and Doug on board. I was obviously worried that they had missed one of their flights and called Jason via Jamie’s cell phone later that night. My worst suspicions were verified. They both made it to Detroit, MI, to catch their long, international flight to Amsterdam. The plane was delayed several hours due to mechanical problems. Because their connection in Amsterdam was so tight, they would miss their flight to Kili Airport. 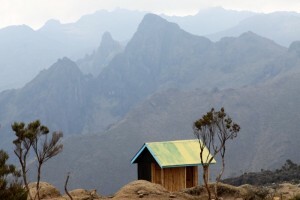 Unfortunately, they made the decision to call it quits knowing they would miss their connection and wouldn’t be able to arrive in Tanzania until we were a day up the mountain. 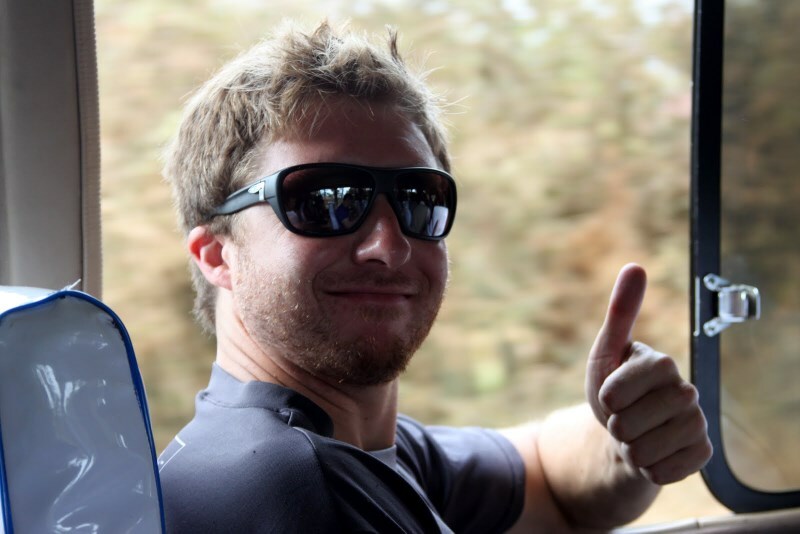 This was unfortunate news to hear and just goes to show to never plan to arrive the night before a big climb when traveling halfway around the world. 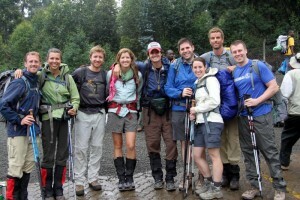 Thus, our Kili 2011 team would have 9 members instead of the originally planned 11. 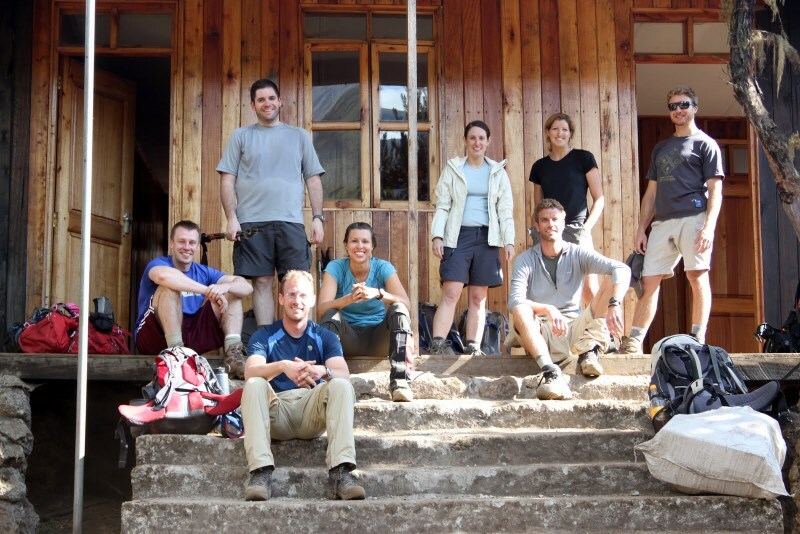 After another great buffet-style breakfast at 7am the following morning and loads of coffee, we all boarded the large van Josephat had arranged for transportation to the Machame trailhead. 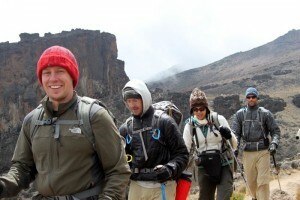 All four of our guides (Josephat, Ernest, August, and Faustine) were with us along with several porters. Our intended ascent route up Kili, the Machame Route, is likely the most scenic route on Kili and provides a good chance for proper acclimitization. 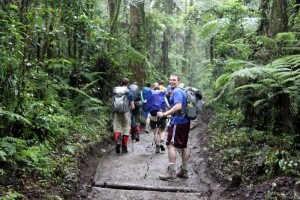 Our intended descent route, the Mweka Route, allows for a direct day and a half descent down to the Mweka trailhead. After about an hour van ride down dirt roads and Alex and Chris buying and trying the local “Banana beer”, which tasted much like distilled vinegar not to my liking, we arrived at the Machame Gate. 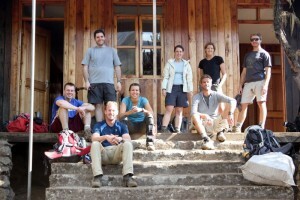 There were many other expedition groups from all over the world getting ready to depart up the mountain as we were. We unloaded all of our gear and they were individually weighed on a scale for each of the porters to carry. We signed into Kilimanjaro National Park’s permit register and were soon on our way hiking up the gravel/dirt road in the cool, misty rain. Day 1 on the mountain had us hiking through rainforests from approximately 5,400′ at the Machame Gate to around 9,800′ at the Machame Hut. The pace was slow as our guides continued to say “pole pole” or ‘slowly, slowly”. I would come to never want to hear these words again by the end of our trip, but understood their intentions. Most people coming to Kili are middle-aged, have never been to altitude before, and are from sea level. All of our group was young and fit and several of us live and train at a mile high or greater above sea level, so being understanding with our guides and the slow nature of the hiking pace was a true test of our patience. Nevertheless, we made the hike more of a social hike with plenty of friendly banter and conversation. Ater a nicely-prepared lunch box consisting of fruit, a tomato/cucumber sandwich, cookie, and mango juice, the rainforests gave way to a more dry, arid climate around 9,000’. 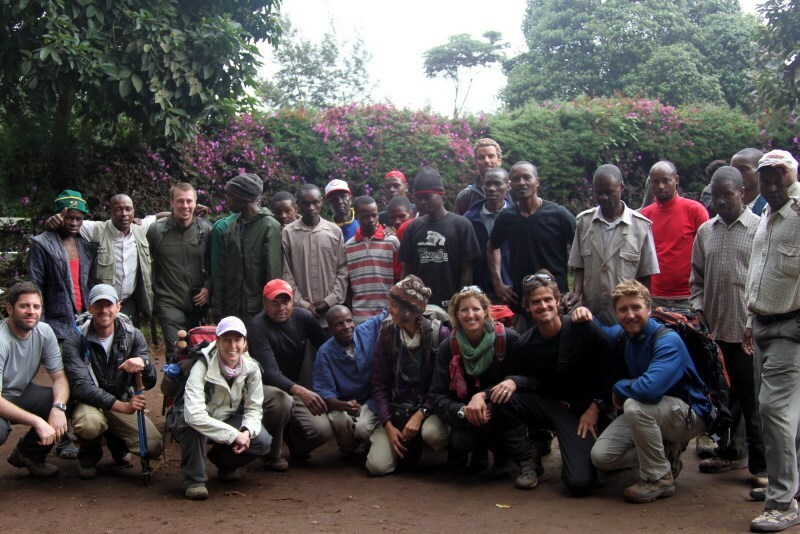 We reached the Machame Hut that afternoon around 2pm and relaxed at our camp set up by the 19 porters who had arrived there before us. Our indvidual tents were set up as well as a fantastic dining tent complete with chairs and a table. Talk about a leisurely, five-star 7 summit! This was great. 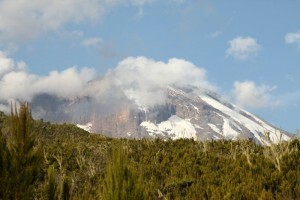 The clouds parted that evening for our first glimpse of Kilimanjaro’s upper slopes and glaciers from the southwest. The team’s spirits were high that night at dinner and everyone was so excited to finally be here on Kilimanjaro after having thought about and planned for it for so long. The food was excellent and we came to really grow fond of our waiter, Harold. It was a gorgeous sunset and after dinner I called my Dad back in Charlotte, NC, via my satellite phone giving him our day 1 progress. We all then hung out for a bit and then retired to our tents and me to my hard back Michael Crichton book “Next” which I packed along for the climb in my daypack. Day 2 began with a wonderfully-prepared breakfast of toast, eggs, and mango. I brought along some Starbucks instant coffee packets which I thoroughly enjoyed. We then packed up our gear and departed the Machame Hut camp around 9am. 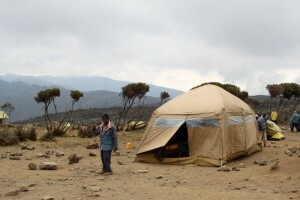 The porters took down our tents and the dining tent and packed them up to be hauled to our next camp on the Shira Plateau. We made our way up the well-groomed, rocky trail along a broad ridge for several hours all the while at a pace only described as “pole pole”. It was amazing to see how many people and different expeditions there were on the trail. Again, we broke out our previously prepared lunch boxes at a small plateau. 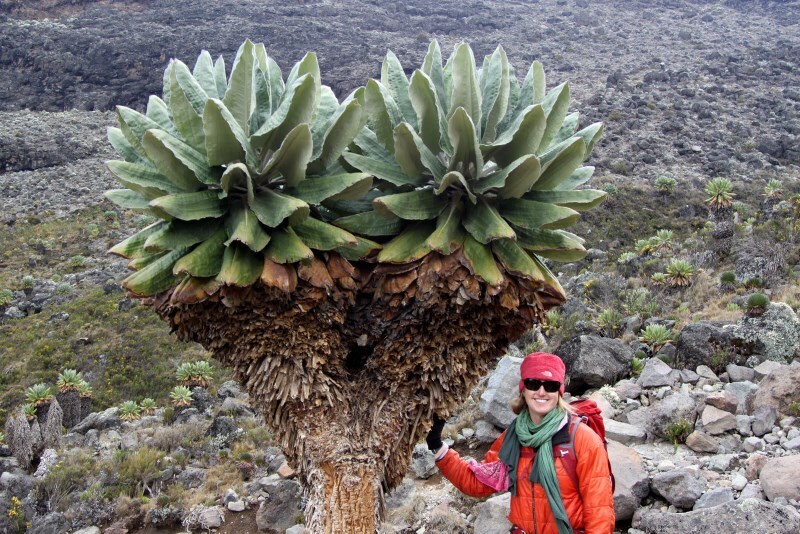 A few more hours of trekking through rocky terrain with strange plants and trees brought us to our camp at the Shira Plateau (12,200′). 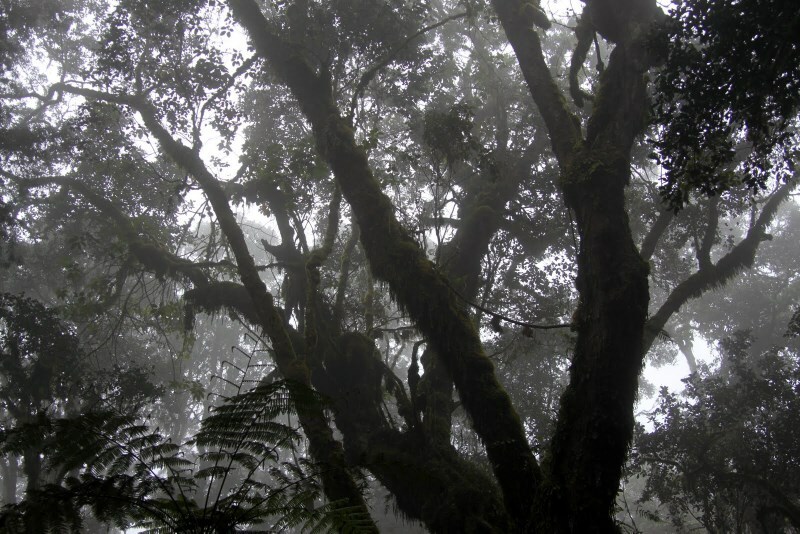 There must have been twenty other expeditions camped here consisting of hundreds of climbers and porters. It was a very scenic camp as we had commanding views of the Tanzanian savannah far below as well as Kilimanjaro’s upper slopes. Kristine, Dave, Scott, Jamie, Chris, Alex, and myself then went and checked our some Shira Plateau tourist attractions such as the Shira Cave, which wasn’t even much of a cave and was a bit disappointing. We then scarmbled around on some rocky outcrops, which made for some afternoon fun and good views of camp and the helicopter landing pad at the Shira Plateau camp used for emergency evacuations. After another amazing dinner and wonderful service by Harold, we quickly made for our tents and warm sleeeping bags as it was indeed much colder at over 12,000′. Again, I was entrained in the biotechnological drama that is the book “Next”. 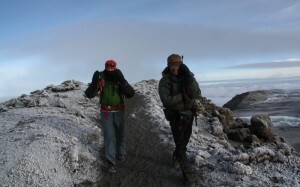 The dry, cold air greeted us on day 3 of our Kili climb. It was actually a nice change of pace from the humid, mosquito-infested lower elevations. Jamie was already up and sitting on a rock outside the tents writing in his journal. Day 3 would be a longer day of hiking and everyone’s personal altitude record thus far except for Kristine and myself. The overcast skies made for absolutely perfect hiking weather. We reached the trail junction with the Lemosho Route after a couple hours of “pole pole” hiking in which several expeditions were coming up. After another hour or so, we all reached the base of the Lava Tower at around 15,000′ at which several expeditions were camped. We broke out our daily lunch boxes here and had a chilly lunch. However, the team’s spirits were again very high as everyone was excited to be at the highest elevation they had ever been and feeling pretty good physically and mentally. The heartbreaking news, yet necessary for proper acccimitization purposes, was that we then had to descend 2,200′ to the Barranco camp at around 12,800′. We all got our first views of the strange plant called “Serencio” on the descent, a plant which we had heard about and seen pictures of for so long. They reminded me of the man-eating plants in the movie “Little Shop of Horrors”. Upon our arrival at Barranco camp, we found our tents and dining tent all set up nicely yet again. This was an amazing camp in terms of the views. 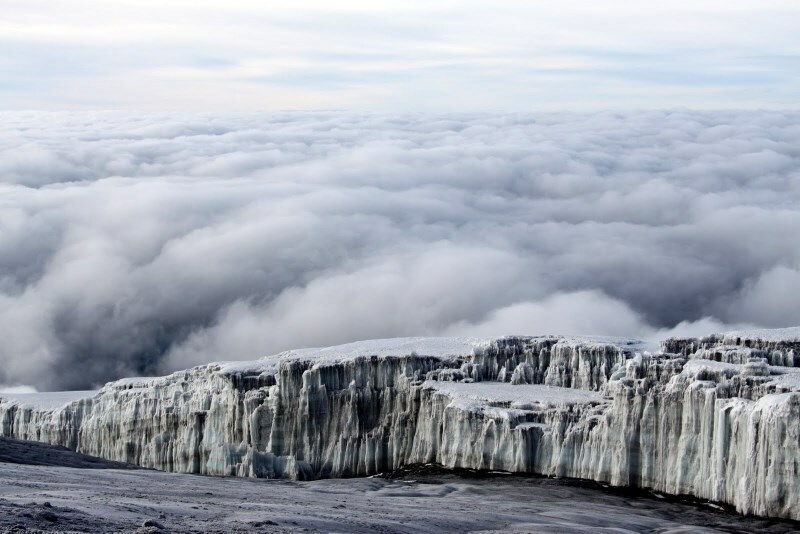 We were well above a sea of clouds stretching far out above the Tanzania plains and were right up against the southwest upper slopes and glaciers of Kilimanjaro. 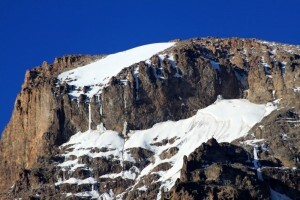 Again, there were numerous expeditions camped here consisting of hundreds of porters and climbers. We played Hearts, a card game Kristine and I learned to love on Everest, for a few hours and took loads of pictures of the group with the alpenglow on Kilimanjaro in the background. It was a great evening with another spctacular dinner. We all hit the sack fairly early again after a big day of hiking and another big day to follow tomorrow. I got out of my tent in the middle of the night to find a near full moon with a starry sky and the moonlight lighting up Kilimanjaro’s glaciers. 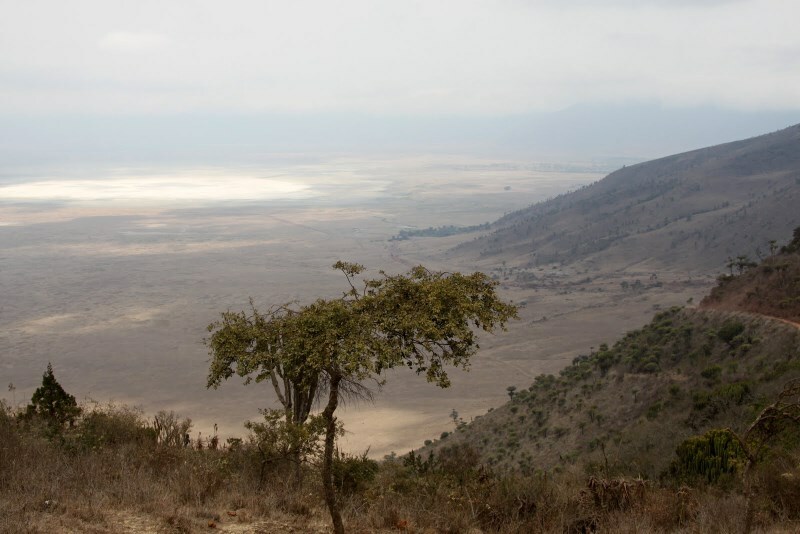 The clouds below had parted and I could see the lights of small villages and Moshi over 9,000′ below on the Tanzanian savannah. I awoke again on the morning of day 4 to find Jamie writing in his journal sitting on a rock outside our tents. Hopefully, he’ll share his intimate secrets and thoughts on the climb at some point in our lives, perhaps when he becomes famous in his hometwon of Toldeo, OH, for all his adventures. Anyway, we had another great breakfast of oatmeal, eggs, toast, mango, and coffee. Then, we were off up the steep trail of the Barranco Wall. 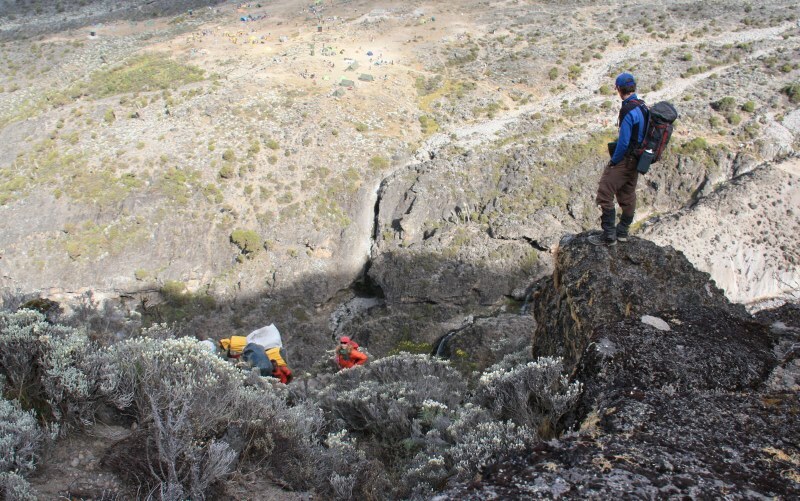 This is probably the steepest portion of hiking on the entire Machame Route and was probably the biggest area for traffic jams of porters and climbers. In many spots, there was only one way to go up, so lines formed in which we just had to play the waiting game. I sort of lost my patience at one point, and just took off climbing up class 3 rock for a couple hundred feet. 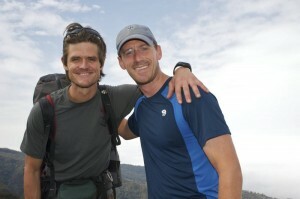 Alex and Chris followed and we passed several expeditions and hundreds of porters. 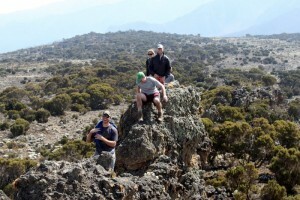 Once we got to the top of the Barranco Wall, we hung out and waited for the rest of the group. I don’t think our guides were too thrilled with us just climbing off and away, but I told them later we just needed a little more excitement for the time being and to get the heart and lungs pumping a little bit. I don’t think they understood. Oh well. Once we all re-grouped at the top of the Barranco Wall, we ate a snack, drank some water, and were off on the long up and down traverse below the southern side of the mountain to the Karanga Valley. The porters and cooks had arrrived at the Karanga Valley camp before us to set up our dining tent, table, chairs, and prepare a hot lunch for us. This was such a treat and we thanked Harold so much for his service. 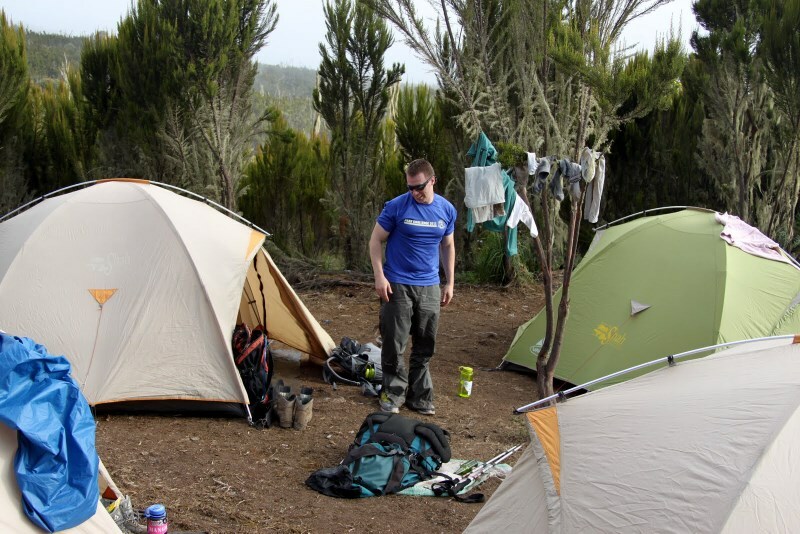 After a great lunch of rice, lentils, and chicken, we set off from the Karanga Valley camp at which several expeditions camp for a night en route to the high camp at the Barafu Hut. 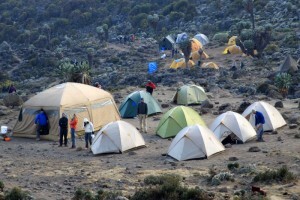 These expeditions that use the Karanga Valley camp are usually on a longer 7 or 8 day program to climb Kili. 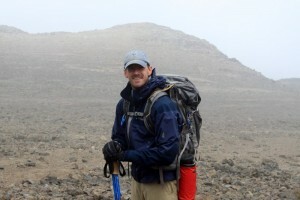 We entered the clouds shortly afterwards on the steeper hike up to our high camp at the Barafu Hut. Again, it was just perfect temperatures for hiking, albeit very slow hiking. But, this “pole pole” hiking was the norm now and we completely accepted it. 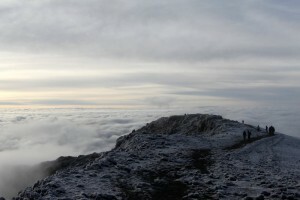 We reached about 14,500′ and got above the clouds. The terrain was nothing less than what I would imagine the Mars landscape to look like. 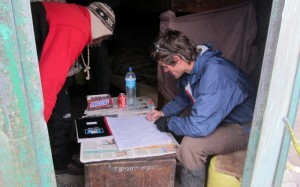 Around 2pm, we reached the Barafu Hut at 15,100′ and I stood in line at the hut itself to sign in the entire group. Our team was very excited to finally be at our high camp in position for our launch on the summit the following morning. We ascended a hundred or so vertical feet higher than the Barafu Hut to where out tents and dining tent were already set up. We then had an early dinner around 4pm complete with lots of hot drinks and played Hearts for a few hours. Before we all retired to our tents for a few hours of sleep, we had a summit day talk with Josephat and the other guides. Kristine, Alex, and I lobbied for a team to depart at midnight and another team at 1pm for the a few of the faster folks just because some of the faster folks wouldn’t generate enough heat to keep warm doing such a slow pace. However, we were quickly shot down and just kept our mouths shut from then on. We were on a guided trip and as much as you don’t agree on some things, you must accept not having the ultimate authority to make our own decisions as we normally do on our own unguided expeditions and climbs. Scott hadn’t been feeling all that well with headaches, so I told him to prop himself up with his head elevated while trying to sleep in order to minimize blood rushing to his head. 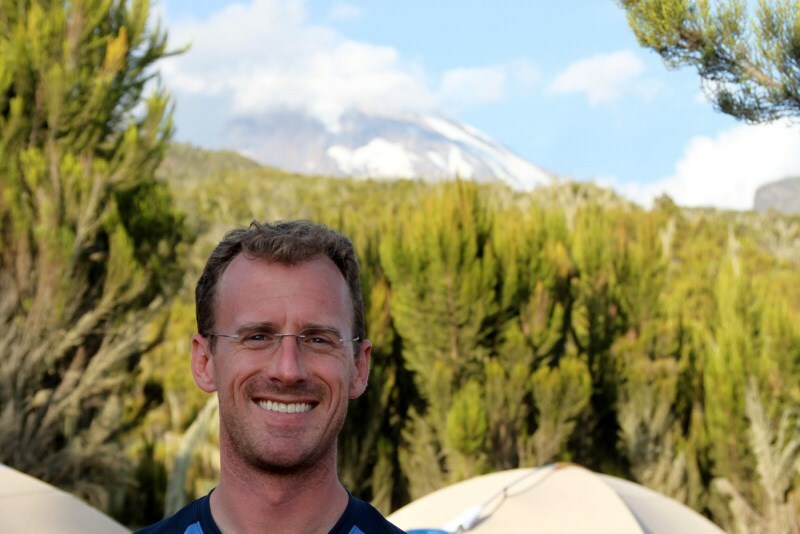 He said it worked tremendously as it had worked for me on Aconcagua in 2006 while sleeping for 4 nights at 19,200′. Darci wasn’t feeling well either due to the altitude but we would see how she felt in a few hours when it was time to wake up and begin our summit day. It was not surprising to me at all that a few of us didn’t feel so well sleeping at over 15,000′, especially the sea level members. I actually got a few hours of sleep and my alarm went off at 11:45pm on Saturday night, August 13. Kristine and I got our gear on consisting of full expedition long underwear, two pairs of socks since we only had our trail running shoes, our shell pants, fleece layer jacket, down mitts, gaiters, knit cap and headlamp, and down parka. We gathered in the dining tent around 12:15am and ate what cookies and crackers we could and drank some coffee/hot chocolate. We then were hiking in the dark under the light of our headlamps by 12:45-1am on Sunday, August 14. Darci and Scott were feeling well enough to continue and really did a great job to put their discomfort and unwellness out of their minds for the time being. The great thing about having August 14 as our summit day was that it was a full moon to the day. It was fairly cloudy on most of the ascent but as we reached Kilimanjaro’s crater rim at Stella Point, we got above the clouds as dawn began to show itself. The ascent up to the crater rim was about 4,000′ of climbing on dirt and scree via a trail very similar to hiking up a class 2 Colorado 14er in the dark. It wasn’t terribly steep or difficult but the altitude makes it tough for most people. At one point around 17,000′, Darci really had hit a wall and was terribly exhausted and coming down with acute mountain sickness (AMS). Scott told me he would stay with Darci and continue very slowly with her. Josephat also stayed with the Hooks and carried Darci’s pack for her. Sarah gave up her pack to August and the rest of us continued on ahead of Josephat and the Hooks. 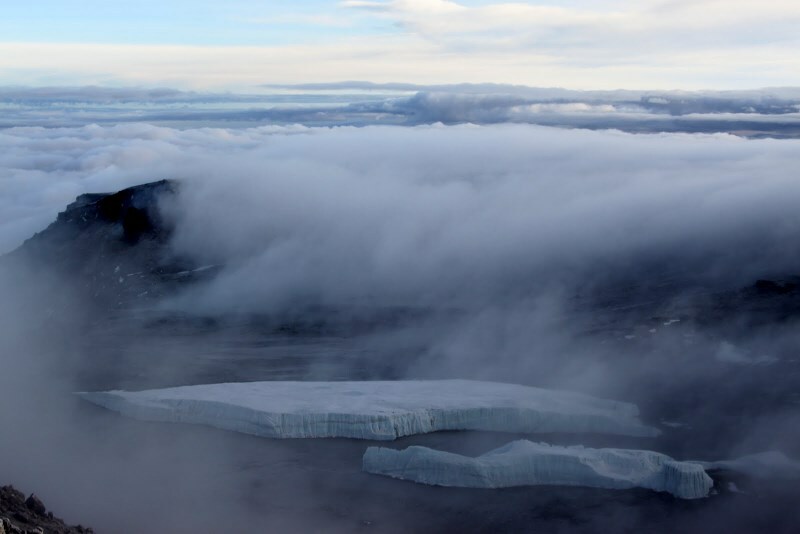 We passed several expeditions on the trail and eventually reached Stella Point at 18,885′ just before sunrise. 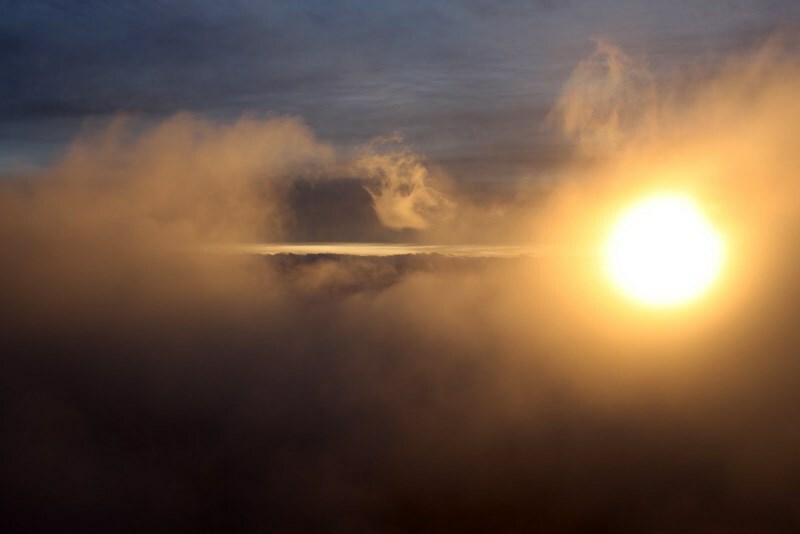 It was very cold on the crater rim and the sun couldn’t rise fast enough to provide some warmth, especially to our hands and toes. We probably stayed at Stella Point for 15-20 minutes trying to warm our fingers and toes and grabbing a bite to eat and a drink of water. I was so hoping, as we all were, that Scott and Darci were doing OK and that they hadn’t turned around. The group continued on with the last 500′ up the crater rim to the true summit of Kilimanjaro, Uhuru Peak, at 19,341′. 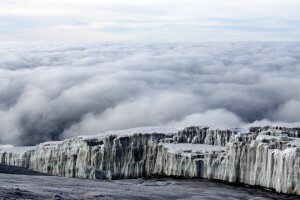 The sun began to light the sky and the magnificent glaciers of Kilimanjaro came in view to the south. It was truly a special summit ridge and absolutely gorgeous. I could almost taste the group’s excitement and sense of accomplishment being so close to the summit. It was truly a privledge being with my wife and such a fantastic group of friends on the roof of Africa and sharing in their excitement at being in such a wild place. After a couple pictures of the glaciers and the group with only a hundred vertical feet to go to the summit, all of the sudden Josephat rounded the corner with the Hooks! I almost couldn’t believe my eyes and the entire group was in shock at such a wonderful sight. I think we had all thought they had turned around but much to our surprise they had made it and caught up with us! I was so happy to see Scott and Darci and so happy for them. They overcame their discomfort and really presevered fully displaying their mental strength, such an important part of high-altitude mountaineering. After reuniting with the Hooks, I walked ahead of the group to give my Dad a call on my satellite phone before everyone reached the summit. It was great to catch Dad and Mom on the phone even though it was 1am east coast time. After several minutes on the phone, I told Dad I’d call him on the way down. I then waited for the entire group to take the final few steps up to the famous Uhuru Peak summit sign on which nowhere is the name Kilimanjaro, a funny side note I thought. Everyone gathered under the summit sign and celebrated. It was a special summit with a special group of people. The sunrise was absolutely breathtaking and we all got our fair share of time with the summit sign complete with numerous pictures of individuals, couples, and the group. Kristine and I got a few summit pictures with some of our Everest sponsors for good measure. Dave, Jamie, Kristine, and Alex then borrowed the satellite phone to call their respective families, which was great to see as I know how special it is for the folks on the receiving end to get a call from one of the highest peaks on the planet from their son or daughter. The Hooks then descended with a few of the guides as they weren’t feeling tip-top, but a few of us hung around the summit to get our summit rocks and take some extraordinary pictures of the crater rim, glaciers, and surrounding sea of clouds below. It was one of the most special and gorgeous summits for Kristine and myself primarily because we got to share it with a great group of friends. After about 45 minutes at 19,341′, the rest of us descended Kilimanjaro’s summit ridge passing several other groups still on their ascent. We made quick work of the descent back to Stella Point and then straightlined it down the dirt and scree much like plunge-stepping down in steep snow. Alex, Kristine, Chris and I soon caught up with Josephat and the Hooks and realized Darci was not doing well at all. She was completely exhausted and was showing all signs of AMS. I gave her a dexamethasone tablet in hopes that would make her feel better. We then waited with her until she had enough energy to get moving again. Again, Alex, Kristine, Chris and I continued onto our Barafu camp and enjoyed some nice refreshing orange drink from Harold and waited for the rest of the team. Dave and Sarah did so extremely well on the climb and came strolling into camp very tired but very happy. The Hooks and Josephat then came in about an hour later. We were all concerned about Darci but she went straight to her sleeping bag and slept. The best medicine for her was descent and we all planned to depart Barafu camp 2 hrs later around noon and descend the mountain. A good hour of sleep and drinking fluids made everyone feel better and everyone was able to rally and depart high camp around 1pm. The lower we descended, the better everyone felt including Darci, which was a welcome sight to see. We descended the very direct Mweka Route all the way to approximately 10,000′ at the Mweka Hut that same day. It was a big summit day, to say the least, that rivaled other big days on even bigger mountains for Kristine and myself. I was very proud of everyone and it was great to see the sense of acccomplishment glistening in everyone’s eyes. 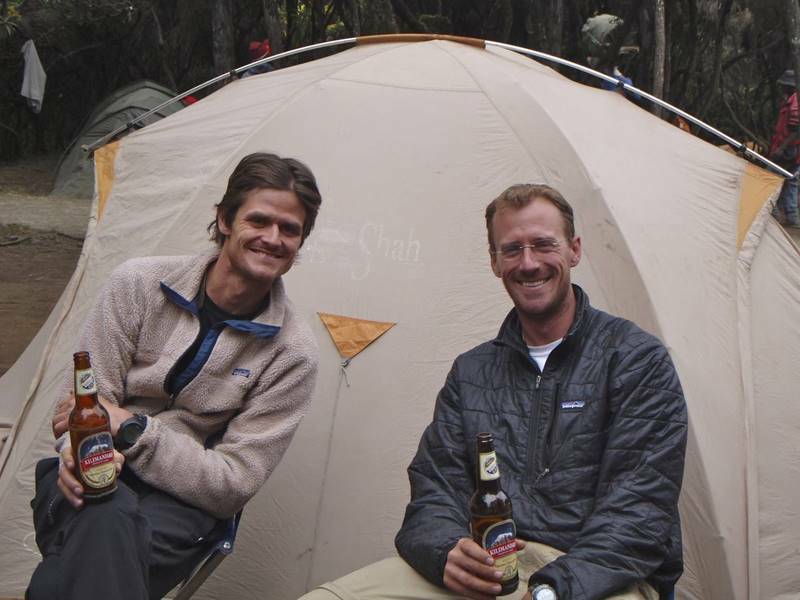 Eventually, after many miles and several thousands of feet of elevation lost, we made it to our camp at the Mweka Hut around 5pm. Alex was generous enough to buy several Kili beers at the Mweka Hut for our group and the guides and porters. 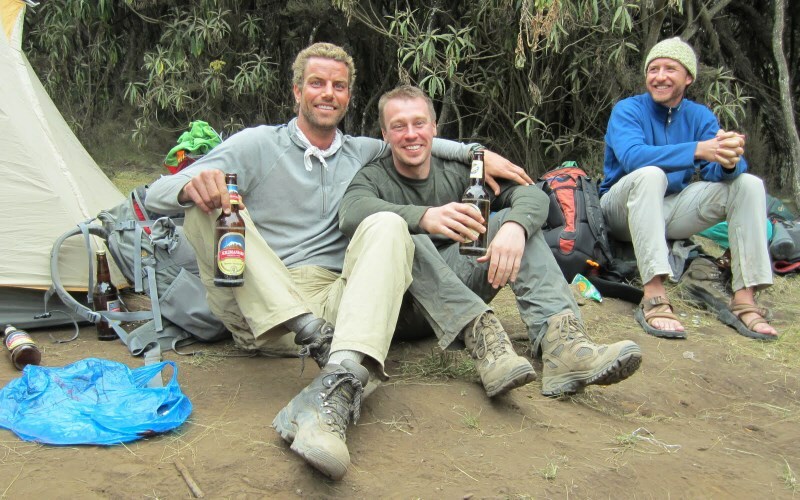 We all gathered around while drinking our beers, shared stories, and reveled in our summit success of Kilimanjaro. We then had a fantastic dinner of the Tanzanian version of fried chicken. After a few more games of Hearts we all settled into our tents and sleeping bags very satisfied. Then it happened. An hour or so after I fell asleep, I woke up feeling extremely nauseous and ready to vomit. I exited the tent and went back into the bushes and proceeded to relieve myself from both ends simultaneously. It was a horrible moment, one that makes you feel like you would rather just die. After a few more episodes throughout the night, morning came and I felt a bit better, though one more episode followed after I drank some of my gatorade mix with water in my nalgene. I then learned that Alex had the same symptoms as I had all night and was still in his tent extremely nauseous and weak. Not able to eat anything but some bread crust, I was able to muscle enough energy along with my trusty nalgene full of gatorade mix and water to head down the mountain. Darci, having done a complete 180 since the day before in terms of her health, hit our condition spot on – food poisoning. Alex and I had a few pieces of the fried chicken, whereas others had just one piece, so we think that might have done us both in. Nevertheless, we both got to feeling better on our descent and enjoyed the remaining miles and thousands of vertical feet through the rainforests. We all finally reached the Mweka Gate around noon and the end of our Kilimanjaro climb on Monday, August 15. We all waited in line to register our summit success with the National Park in order to receive our summit success certificates. Josephat and his crew prepared a wonderful Tanzanian lunch for our group but all Alex and I could do was cradle our Coca-Colas to settle our stomachs. Josephat then handed me everyone’s certificates in which I would later sign and hand out to the team members. Our entire Kilimanjaro crew including all guides, cooks, and porters then sang us the Kilimanjaro Song, which was a sight to see and experience and much appreciated. After a couple group pictures, we paid up on our porter tips and said our farewells to the cooks and porters. 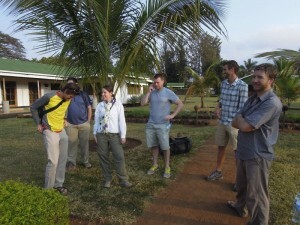 We then boarded the van with all of our gear for transportation back to Moshi and the much anticipated Ameg Lodge. After some much needed showers, we all hung out together in the open-air restaurant and enjoyed beers and appetizers. I thoroughly enjoyed chocolate ice cream as it was the only thing I could stomach. Alex had retired to his room for the afternoon and night in hopes of feeling better for his safari. Kristine and I then broke out all of the outdoor gear we had brought from Colorado as tip payment for the 4 guides. August, Ernest, Faustine, and Josephat were extremely appreciative of the hiking shoes, fleece jackets, rain jackets, hats, and gloves we had brought. It ended up that on summit day near the crater rim, I noticed August wasn’t even wearing gloves so I happily gave him my Marmot gloves I had worn on Everest and other mountains in Colorado. He needed them much more than I and I think he appreciated the gesture. We all had a nice dinner at which I was able to eat some pizza and down 3 Sprites, which tasted oh so good. Alex was still absent but hopefully getting better. Kristine had prearranged with Josephat a 1 day safari to the Ngorongoro Crater for herself, myself, and the Hooks. 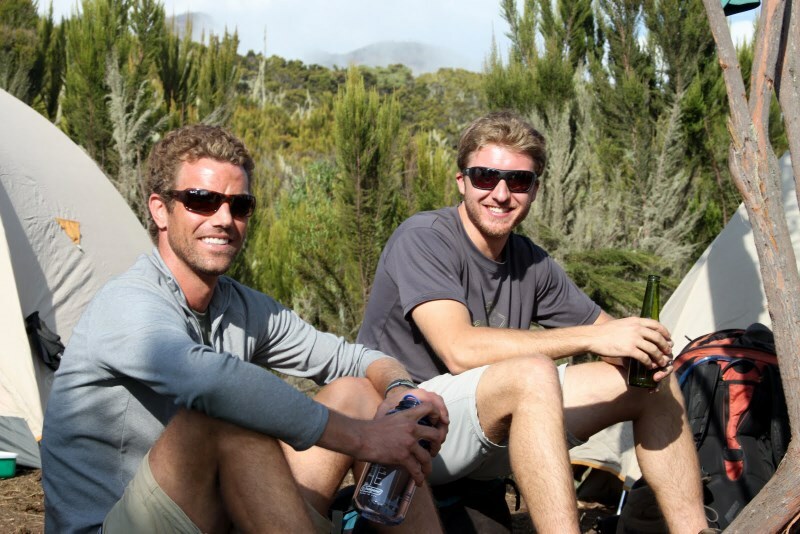 Chris and Jamie would relax by the pool and Dave, Sarah, and Alex would leave on their 4 day, 3 night safari. We all had breakfast together and it was great to see a chipper Alex the next morning who was feeling much better and seemed to be a new man. We all said our respective farewells, though Kristine, the Hooks, and myself would see Jamie and Chris later that evening. 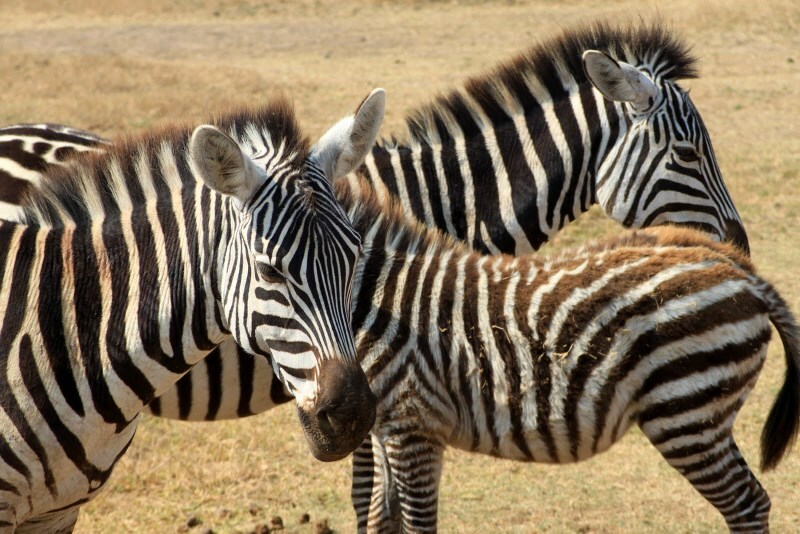 While I am glad we did a 1 day safari and saw the Ngorongoro Crater and its many animals, I would not again try and do that specific safari all in a day from Moshi. 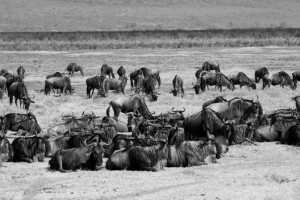 We later told Josephat to advise against doing so for any upcoming clients interested in a 1 day safari and I think he understood. 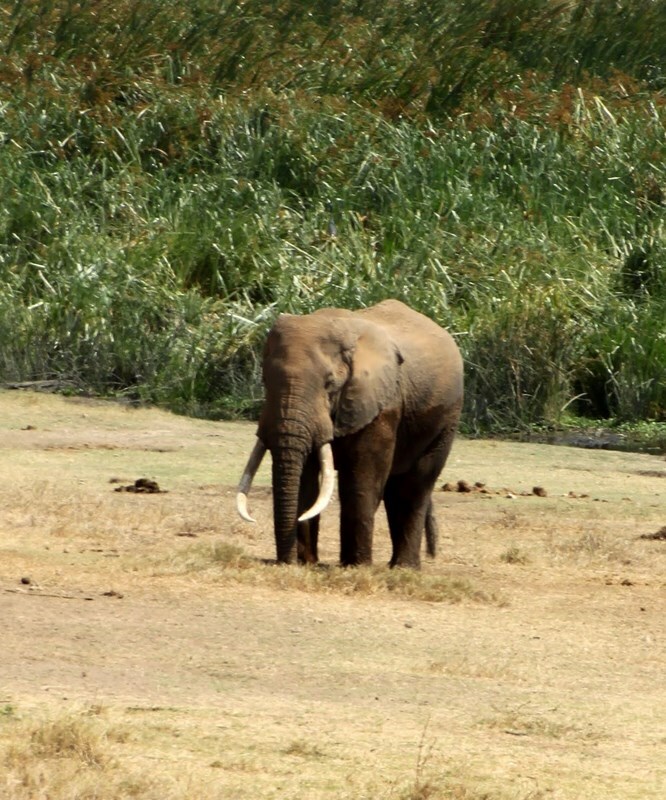 However, it was a great day with Scott and Darci, an interesting 4 hour ride in a custom land rover each way, and a fun few hours in the crater observing the many animals we would never see again with our own eyes. 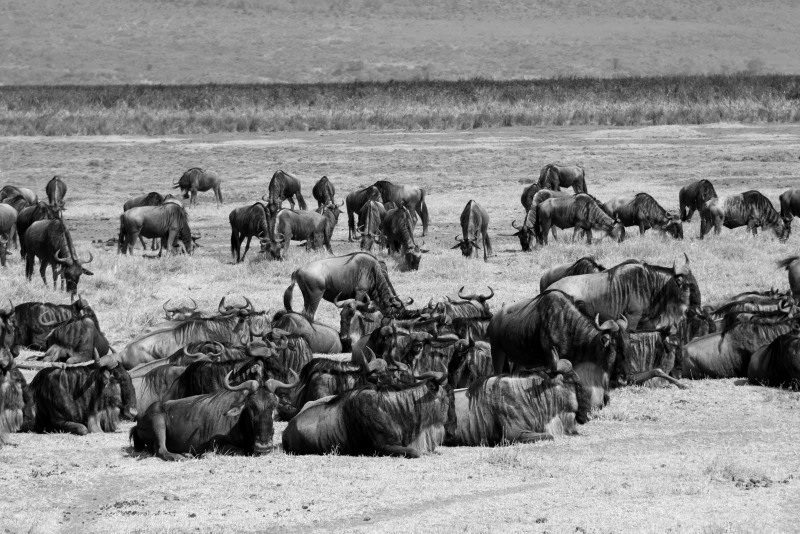 We ended up seeing lions at a distance, elephants, zebras, wildabeasts, cape buffalo, hyenas, a serval cat, hippos, baboons, and a rhino at an extreme distance. 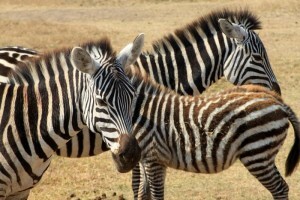 I now understand why people come to do a safari with mega-zoom lens cameras. The animals aren’t always up close and personal as is advertised. We finally returned to Ameg Lodge around 9pm absolutely exhausted with our butts even more exhausted from sitting all day. The next day Chris boarded his bus back to Nairobi and Josephat and his crew took myself, Kristine, Jamie, and the Hooks back to the Kili Airport. We said our goodbyes and promised to keep in touch with Josephat and send him business and prospective clients when we could. Jamie’s flight through Amsterdam left an hour after the Chalk/Hook flight so we said goodbye to Jamie and congratulated him on a job well done. He should now be viewed with most certainty in everyone’s eyes as “Extreme Buckley”. The Hooks and Chalks then traveled back to Addis Ababa and got spectacular views of Kilimanjaro above the clouds on the flight. I had to jump over a few passengers to get to the right side of the plane even when the seat belt light was still on due to take-off, but hopefully the passengers understood. After a long delay, we boarded the night flight to Rome and then straight to Washington Dulles in DC. We then said our goodbyes to the Hooks in Dulles as we went back to Denver and they to San Diego. Kristine’s parents picked up up at DIA and we all rode back to Vail together sharing stories of the trip with them. They were in town to share in Kristine’s final 55th Colorado 14er hike and celebration 2 days later that Saturday, an event which went extremely well. Congratulations to J and Kristine on being Colorado 14er finishers! Welcome to the club! 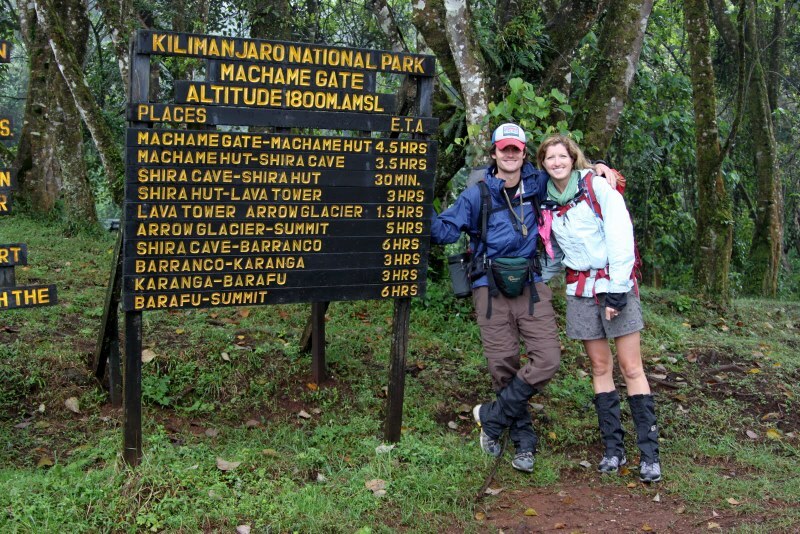 Reflecting back on our Kilimanjaro climb, Kristine and I are both so happy and fortunate to have great friends who want to share in the adventure of traveling to other continents and climbing big mountains. 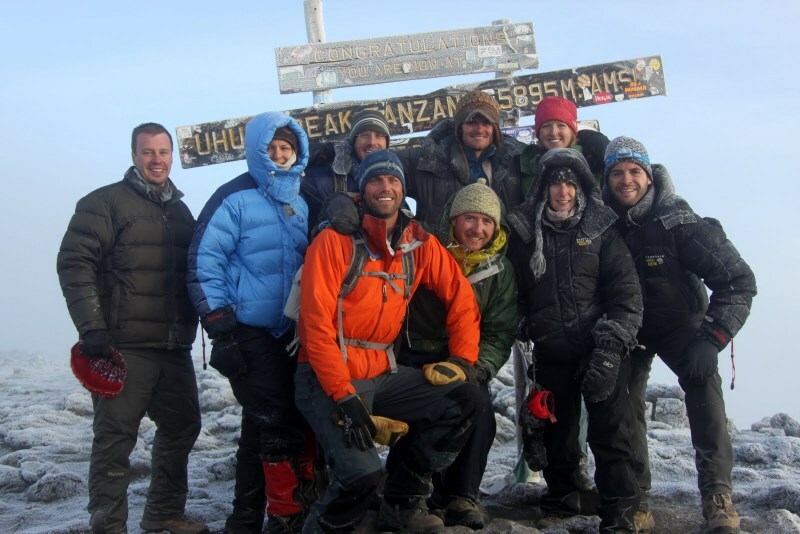 It was truly special for us to have great friends share in one of the 7 summit climbs with us and was just awesome to see everyone go through the planning and training process leading to ultimate success and sense of accomplishment on Kilimanjaro. It truly would not have been nearly as fun and rewarding if we did not have the seven of you with us. Congratulations to Kristine, Chris, Jamie, Alex, Scott, Darci, Dave, and last but not least, Sarah. Hopefully, some of us will share many more adventures together on other mountains or on other continents.